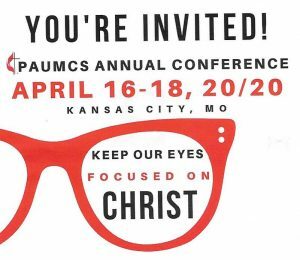 Each year United Methodist Church Office Professionals from across the country and sometimes the world, meet for the PAUMCS Annual Conference. A different area hosts each year. In 2009 we met in Des Moines, Iowa, in 2010, Orlando, Florida, in 2011, Knoxville, Tennessee, 2012 in Richmond, Virginia, 2013 in Arizona, 2014 Asheville, NC, 2015 in Atlanta, Georgia, 2016 in Wichita, Kansas, 2017 in Chicago, Illinois, 2018 Nashville, Tennessee and 2019 PAUMCS at Sea! Without exception, these events are well-run, informative and fun! Next year, 20/20, April 16-18, Kansas City Missouri! Scholarships to attend PAUMCS annual conferences are granted on an individual need basis and limited to monies available through the Leslie Bayles Memorial Scholarship Fund. Scholarships are processed in the order in which they are received. This is done in order to give the applicant, if the scholarship is granted, ample time to make the necessary travel reservations to attend the annual conference. Preference is given to members of the National Association as a benefit of membership. The deadline for applications, which coincides with the annual conference early registration deadline, is set as a cutoff only in the event that scholarship funds have not been exhausted by that time. Scholarships are granted to the same person only once in in four years. Members of the National Association submitting proper application to attend an annual conference of PAUMCS will be given preference. Other applicants will be considered as funds are available. Scholarships to individuals shall be granted only once in a period of four (4) years. Deadline for applying shall be the same date as the early registration date for the annual conference. Scholarships shall be granted on an individual need basis and limited to monies available in the scholarship fund. The amount of each scholarship for registration shall be considered by the PTS committee, with at least fifty (50) percent of the registration fee for the annual conference being granted. Request an application from the conference registrar or the PTS Committee Chair. Complete both sides of the application, answering all questions. Donate to the Leslie Bayles Memorial Scholarship fund. Print out a Leslie Bayles Memorial Scholarship Fund donation brochure.